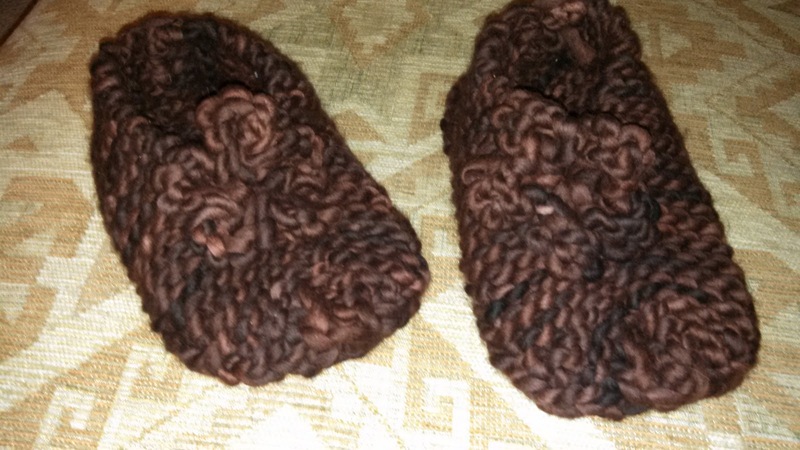 I made these beautiful slippers in about 5 hours. Very fun. Large chunky yarn and large needles. Let me know if you want me to make a pair for you! Repeat last 2 rows until piece measures 7-1/2 inches. Repeat row 3 once more. Cut yarn leaving a long tail. Pull yarn through remaining sts. Turn slipper inside out and seam up the slipped sts until there are 4 inches remaining to heel. Leave the remining 4 inches unworked (foot hole). Sew flower in place on the slipper.